In Maryland coal, natural gas, and petroleum are the fossil fuels utilized to produce electricity. The primary fuel used for electricity in Maryland in coal. However, due to declining prices in recent years, the use of natural gas used to generate electricity has increased. In 2015, Maryland consumed 6 million tons of coal for electricity generation, which was a decrease of 19 percent compared to 2013. Most Maryland power plants cannot efficiently burn coal mined in the state because they were designed for coal with higher volatility characteristics. Based on 2015 data, 96 percent of the coal received by Maryland plants was mined in the Appalachia region of the U.S. Table 2-2 lists the amount of coal received at each power plant in 2015 and its origin. According to the U.S. Energy Information Administration (EIA), U.S. bituminous coals sold for an average of $60.61/ton in 2013 compared to $14.86/ton for sub-bituminous coals. Source: U.S. Energy Information Administration, Natural Gas Consumption by End Use for Maryland, July 29, 2016. In 2015, approximately 39.6 million cubic feet (MMcf) of natural gas was used for electricity generation in Maryland, representing 19 percent of total statewide consumption of natural gas for all uses. 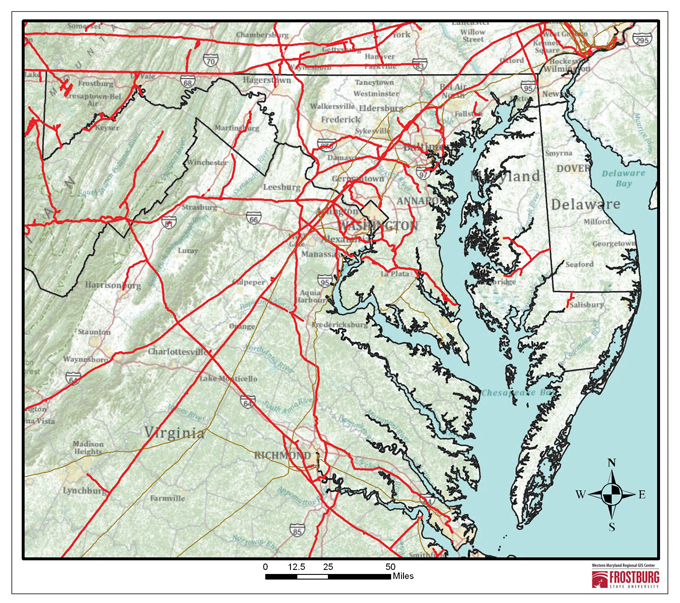 Currently, Maryland receives natural gas from several interstate pipelines that traverse the state (see Figure 2-3). Interstate gas suppliers operate storage areas, usually in depleted production fields, where natural gas can be accumulated during low demand periods and released during high demand periods. Maryland has one such storage area, Accident Dome in Garrett County, with a storage capacity representing 2 percent of the underground gas storage capacity in the region (which includes Maryland, New Jersey, Pennsylvania, Virginia, and West Virginia). Other potentially suitable storage sites may also exist in Western Maryland. There has been a significant increase in natural gas production in the U.S. resulting from the use of new drilling techniques. Shale gas trapped in deep, fine-grained rock formations in the southwest and northeast regions of the U.S. was not economical to recover until the development of horizontal drilling and hydraulic fracturing techniques in the 1990s. Between 2010 and 2015, as natural gas producers continued utilizing these techniques, U.S. natural gas production increased 29 percent. Domestic natural gas consumption over the same period increased only 14 percent, resulting in decreased imports of natural gas via pipeline from Canada and a reduction in liquefied natural gas (LNG) imports. 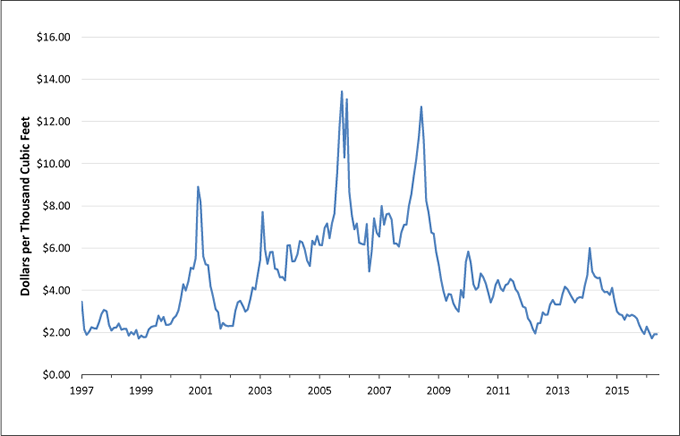 U.S. natural gas spot prices at Henry Hub were between $2.00 and 2.50 per million British thermal units (MMBtu) in the late 1990s, and then began a steady increase, more than doubling to over $5.00/MMBtu by 2003 and reaching a high of $13.42/MMBtu in late 2005. Since then, natural gas prices have decreased to an average of $2.62/MMBtu in 2015, primarily attributable to increased shale gas production coupled with the economic slowdown (see Figure 2-4). Source: U.S. Energy Information Administration, Henry Hub Natural Gas Spot Price. The LNG price is linked to that of crude oil, which has increased as domestic natural gas prices have declined. The annual average export LNG price increased slightly from $1.05/MMcf in 2010 to $1.08/MMcf in 2015. Import volumes at the Cove Point LNG facility in Lusby, Maryland declined 72 percent between 2010 and 2015. Cove Point, which is owned by Dominion Cove Point LNG, LP, an affiliate of Dominion Resources, Inc., is one of 12 LNG import facilities operating in the U.S. Plans for new or expanded LNG facilities in the U.S. have either been canceled or modified for operation as LNG export facilities, in response to high LNG export prices. On October 7, 2011, the U.S. Department of Energy (DOE) authorized Dominion Cove Point LNG, LP to enter into contracts to export LNG to countries that have free trade agreements with the U.S. On April 1, 2013, Dominion announced that it had entered into 20-year contracts for all of the export capacity at Cove Point. Pacific Summit Energy, LLC, a U.S. affiliate of Japanese trading company Sumitomo Corporation, and GAIL Global (USA) LNG LLC, a U.S. affiliate of GAIL (India) Ltd., have each contracted for half of the marketed capacity. On September 29, 2014, the FERC issued an order authorizing Dominion Cove Point LNG to export LNG. The next month, construction began, and Cove Point is targeted to begin operating as an LNG export facility in late 2017. A small amount of electricity  less than 1 percent of the State’s total  is generated by combusting distillate or residual fuel oil. According to the EIA, fuel oil consumption for electric power in Maryland totaled 37.5 million gallons in 2014, or less than one percent of statewide consumption for all fuel oil uses. Since there are no crude oil reserves or refineries in Maryland, all supplies of petroleum necessary to meet the State’s consumption needs are imported. Petroleum is transported via barge to the Port of Baltimore and via the Colonial Pipeline. The Colonial Pipeline, a major petroleum products pipeline, traverses the state on its way to New York. U.S. Energy Information Administration, Natural Gas Consumption by End Use for Maryland, July 29, 2016. U.S. Energy Information Administration, “Price of Liquefied U.S. Natural Gas Exports,” release date June 30, 2016. U.S. Energy Information Administration, “U.S. Natural Gas Imports by Point of Entry,” release date June 30, 2016. Federal Energy Regulatory Commission, “Order Granting Section 3 and Section 7 Authorizations,” September 29, 2014, https://www.ferc.gov/CalendarFiles/20140929192603-CP13-113-000.pdf (Download Adobe Acrobat Reader).